Geronimo Stilton, intrepid editor of The Rodent’s Gazette, doesn’t like to fly, is scared to swim in the ocean and definitely does not want to learn to scuba dive. It doesn’t take much, however, to be persuaded to holiday on Shell Island. He only needs to be asked ... by Petunia Pretty Paws, a mouse he has a total crush on. While learning to scuba dive, Geronimo stumbles on an enormous oyster. Afraid less scrupulous mice may try to steal it for the pearl within, Geronimo and Petunia hatch a plan to get it back to the New Mouse City Aquarium. But they may just be too late! Geronimo Stilton is a reporter who has a nose for adventure and trouble. The story echoes the style of the hardboiled gumshoe detectives, but for younger audiences. Stilton is a klutz and unlucky, but somehow he eventually stumbles onto the right answer. Clues throughout help the reader to figure out what is going on. These rely on close inspection of the full colour pictures which are on every page. Readers could spend a long time looking at the illustration of the editorial staff at the Gazette and still not notice everything that’s going on in the picture. In the end pages are an elaborate plan of the Gazette, a map of New Mouse City, and a map of Mouse Island. Places on these maps have fabulous names such as Goose Bumps Gorge, Rio Mosquito, Cannycat Castle and San Mosquito. These maps are well worth close inspection. The characters and their names are fun throughout the book - from the supporting cast, Aunt Sweetfur, Bugsy Wugsy and Benjamin, to lesser characters such as the pilot Flash Pirouette and the hotelier Pinch Provolone. 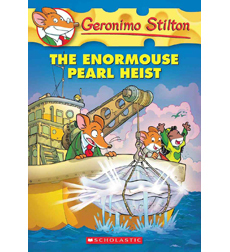 The Enormouse Pearl Heist is perfect for beginning and younger readers. The text is large and broken up, not only by illustrations, but also by the text itself which changes size, colour and typeface. The chapters are short and have headings which reflect the sensationalism of newspaper headlines. It’s An Invasion! A Drowned Rat? Stay Still! This book is number 51 in the Geronimo Stilton series so there are plenty for a budding young fan to catch up on.